Today I am in Chicago! When this post goes live I will be enjoying my last day in the city after traveling for a friend's wedding on Saturday. It has been years since I visited and I've so been looking forward to this trip! These muffins are a wonderful side dish with any meal - especially with the cooler weather starting to arrive (or at least starting to think about arriving)! They are tender, chock full of yummy cheese and deliciously garlicky. You can reheat leftovers in the oven. You can eat at room temp, but with all that cheese in the middle, served warm is best. 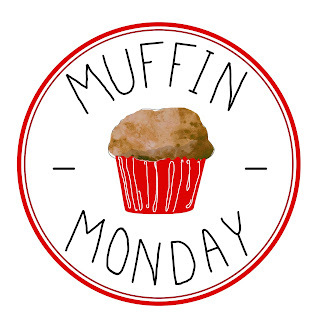 See all the Muffin Monday offerings today! Preheat oven to 350 degrees. Spray a 12 opening standard muffin tin with nonstick cooking spray. Place butter and garlic in a microwave proof bowl and melt in 30 second bursts. Keep warm (leave in microwave). Sift together dry ingredients in a bowl. Make a well in the center, and add wet ingredients. Mix until just combined (it should be a lumpy thick batter). Dollop a heaped tablespoon into each hole. Top with a slice of cheese and drizzle each with 1 tsp garlic butter. Divide remaining batter between muffins, then drizzle over remaining garlic butter (about ½ tsp each). Bake for 20 - 25 minutes or until the muffins are golden on top and spring back when touched in the center. Best served warm so the cheese in the middle is still gooey. Well wouldn't these be perfect with a bowl of soup or pasta! I knew I would like these just by the title but then you added CHEESE. LOVE! Oh my goodness! These sound amazing. All of that garlic butter is calling my name.